I currently have three very different machines for grinding wheat: the Blendtec Total Blender, the Country Living Grain Mill, and the Nutrimill. The results of this test are surprising, because my initial hypothesis was that the Country Living Grain Mill would produce flour with the highest density. However, I based that hypothesis on the appearance of the flour, not the actual measured density. The only variable that changed intentionally was the grinding machine. Determine if the different machines produce a significantly different flour density. One other item to note is the significantly different grinding temperature of the three machines. I didn't try to measure this, but based on touch alone the Blendtec and Nutrimill both produce warmer flour. Per the manufacturer's website, the Nutrimill grinds at less than 118°F, which is still considered low enough to maintain nutrients. Each of the three machines use different technology for grinding and, therefore, each possesses different inherent benefits. The Country Living Mill grinds the wheat by hand cranking one rotating plate against one stationary plate at approximately 60 rpm depending completely on the strength and stamina of the person cranking the handle. The Blendtec and Nutrimill are state of art modern machines utilizing AC electric motors and the high-speed impact of the rotating blades to explode the grains into flour vs. physical grinding. The result? The Country Living Mill doesn't warm the flour because of the much slower grinding speed. If losing nutrients is a concern for you, you may want to keep this in mind. The Nutrimill performed best by producing flour with the expected density of 125 grams/cup for most recipes. If you use a machine at home to grind wheat, it's worthwhile to take some measurements in order to determine the density produced by your combination of machine type and measurement technique - i.e. sifted or not sifted, compacted or not compacted. If you're getting frustrated with your baking results, the variation in your measurement technique and grinding method may explain some of the variation in your recipes. 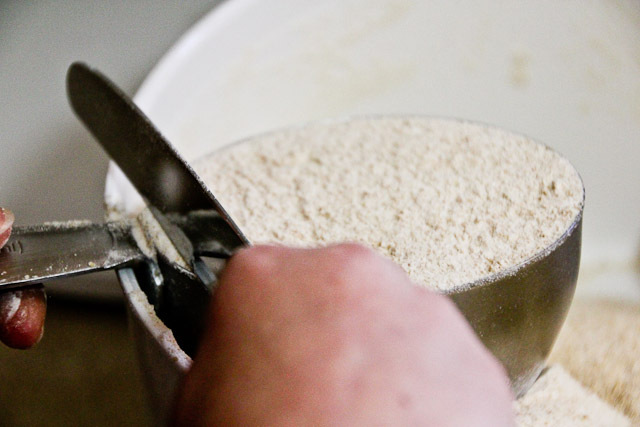 Do you use sifted, unsifted or compacted flour when measuring? Or, do you stress over measurement at all? Do you simply "eyeball" the appearance and texture of the flour as it mixes in order to determine if you need to add more? You get the idea... and here is my video of a bread recipe that uses the 'eyeball' method to determine when enough flour has been added. So, that's it! I hope these test results give you something to consider the next time you grind your own wheat flour. This article contributed by April Jones from http://www.kitchen-blender-reviews.com/ a resource for healthy recipes, tips on how to buy a blender and Blendtec or Vitamix recipes. Visit her site for a variety of healthy recipes, kitchen appliance reviews and cooking tips. 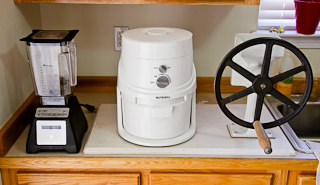 Can I grind wheat in my Vitamix or do I need special blades or a special carafe? As you probably know, Vitamix offer's both a wet blade and a dry blade container (the dry blade container retails for $144.00) . The dry blade has a different blade configuration which Vitamix recommends for grinding dry grains, rice and beans. I haven't tested the two containers, but found several videos demonstrating there is no visible difference between flour produced using the dry blade. If you check the measured density you may find some variation between the two. Therefore, you can save some money and grind your wheat with the standard wet blade container. Beware ... grinding dry grains will cause your container to become frosted in the bottom third due to the grains scratching the container. But I would not expect any issues with using the wet blade to grind wheat. I have ground many pounds of wheat in my Blendtec with no issues other than a frosted container. 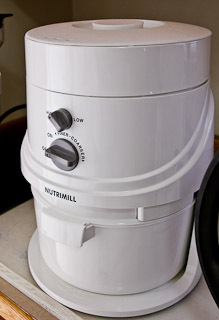 Freeze your wheat berries prior to milling in the NutriMill. You'll notice a significant temp reduction in the finished flour. Do you find you prefer the bread made from the Nutrimill or Country Living Mill more? Or are they similar? I'm trying to determine if one of the mills can grind more finely than the other. I use a Komo PK 1. You can adjust the flour from fine to coarse. You do have the added benefit of stone grinding. It costs a bit more, but the results are worth it.